For many, dowsing is used just for finding water however the truth is that dowsing can be used for a wide range of things as diverse as health,decision making,finding positive and negative energy lines, archaeology work etc. Dowsing is regarded with great scepticism by many, and as such is scorned as a working system. One has only to look at reports of people like the Thames Water Board using dowsers to find water leaks, soldiers in the U.K. and in America being taught dowsing to find such things as mines, NASA using a dowser to find out the weight bearing capabilities of the moon for the moon buggies, oil companies using dowsers to find oil and many more examples, to realise such people are not going to waste money on things that don’t work. Why do people doubt dowsing which has been around for thousands of years? The reason is that people like academics, scientists and engineers need an explanation of how dowsing works and there isn’t an explanation. When a dowser who has been employed to find water says dig down here 100’ and you will find potable water providing 200 gals/ltrs per minute, it does take a leap of faith to spend a lot of money putting in a bore hole. However thousands of people take this leap and are successful. It does not matter whether you are looking for water, Ley lines, water pipes, or a long gone 15C building, the techniques are the same. Like scientists, archaeologists are also prone to doubting the capabilities of archaeology dowsers because they can’t provide a readout of findings or hear a bleep if using a metal detector but there are a few enlightened archaeologists who are beginning to see some benefits of dowsing. How accurate are these findings of ground penetrating radar? What happens when these readings are taken in chalky ground where the beams are bent. Is that then still regarded as being accurate? How costly is the equipment? How time consuming is it to take a survey? With dowsing many things can be located very quickly and the whole footprint of a building from ages past can be found. So archaeology dowsing can save a lot of time and money. Gradually some awareness of the benefits of archaeology dowsing is taking place in the archaeology world and such organisations as the National Trust have used dowsers to find the sites of past buildings. 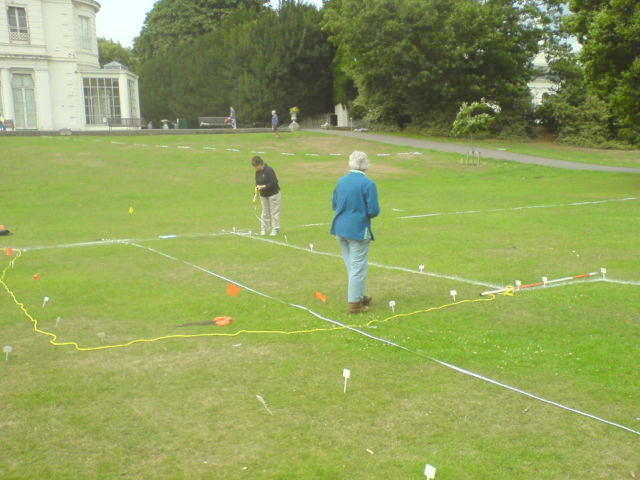 The Middlesex and Surrey Archaeologists Dowsers (MASAD)who are affiliated to the British Society of Dowsers was formed not only as a help to any enlightened archaeologists who could perceive the uses of dowsing in their work, but also for dowsers who have an interest in history and archaeology. The group is not a group for those who just want to dowse for things but is a group with serious intent. MASAD not only has dowsers amongst their numbers but also non – dowsers who do research on the various sites to be visited. They compile dossiers on the site with maps, historical notes and as much information as they can discover. They also make pre-site visits to interview people, take photographs and report back to the team. On the day of a site visit we are also accompanied by a photographer(s) and members who do the data recording, measuring and GPS recording. These measurements are undertaking using the usual archaeology methods. site details/location, GPS reports and plans. along with photographs are made. The reports are then filed with copies sent to interested parties including the British Society of Dowser’s archaeology special interest group.